Michael Szell’s Drawing and Dancing Green Room. 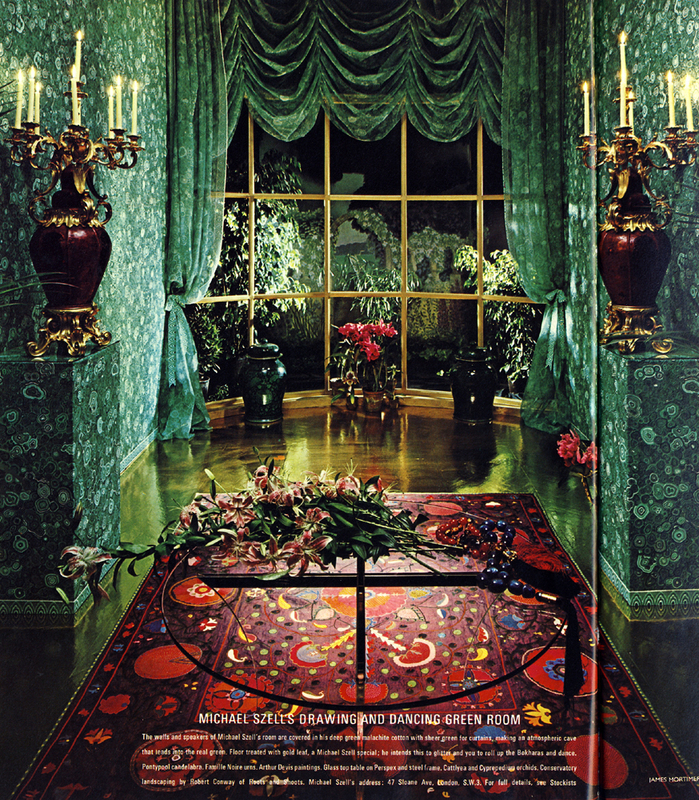 The walls and speakers of Michael Szell’s room are covered in his deep green malachite cotton with sheer green for curtains, making an atmospheric cave that leads into the real green. Floor treated with gold leaf, a Michael Szell special; he intends this to glitter and you to roll up the Bokharas and dance. Pontypool candelabra. Famille Noire urns. Arthur Devis paintings. Glass top table on Perspex and steel frame. Cattlyea and Cyprepedium orchids. Conservatory landscaping by Robert Conway of Roots and Shoots. Barbara Hulanicki at home in one cavernous studio which she found three years ago and filled with Art Deco from floor to ceiling. Walls, ceiling, stairs, all painted a rich matt brown, merge into the shadowy interior; angles and lines are softened and blurred. Colours, not walls, mark out living areas, a different shade for each section of space. Light is filtered through the brown-tinted glass of the high, patterned perpendicular window and a long fanlight in the roof. 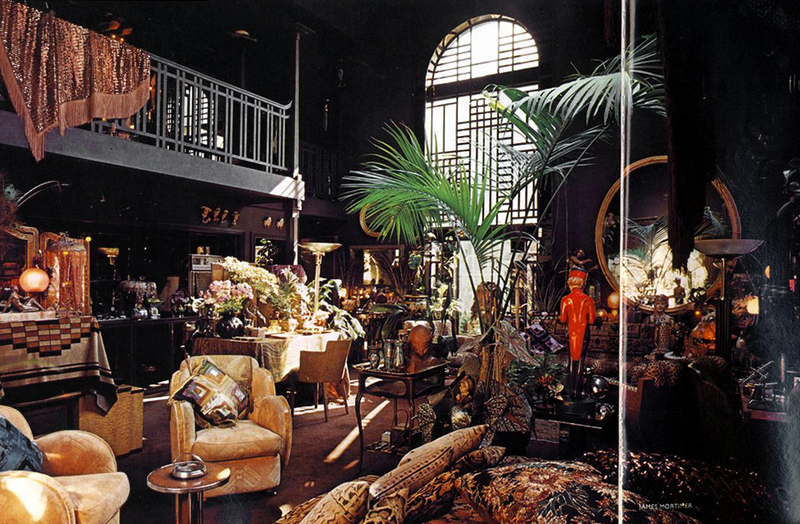 A brown spiral staircase, leafy with plastic twisting plants, leads to a long gallery which forms the dressing-rooms. 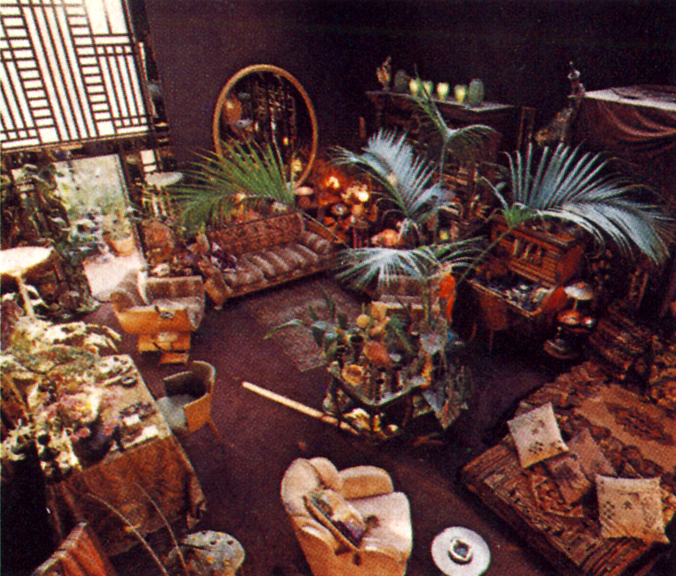 Everywhere, an endlessly intricate arrangement of colour, pattern, space; a deep, dark brown jungle of the ornamental, the exotic, the glittering. Photos by James Mortimer. Vogue, October 1975. The dressing-room. Shades of peach and deepest brown, Creamy lighting from bulbs set behind opaque glass. Peach mirrors hung with beads, the dressing table, a darker shade of smoked peach, made up of tiny individual drawers. Stool topped with smoked peach glass. 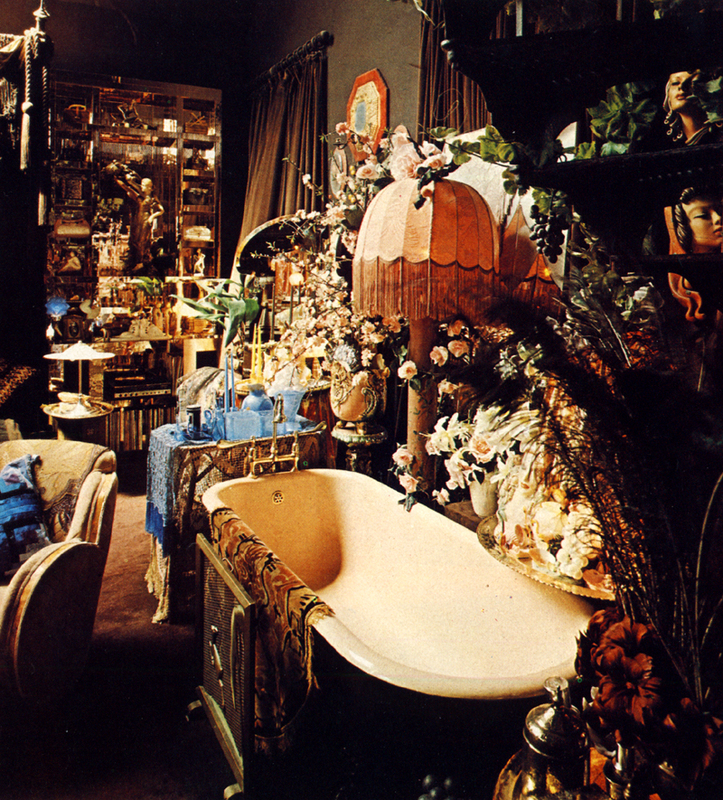 The bath, a riot of peach and plastic flowers. Ornate brass taps, Art Deco screen. Brilliant blue glass, candlesticks and pearly plastic grapes. Barbara Hulanicki in the sitting-room, the window open to reveal a jungle of climbing plants outside. In the background, a collection of Art Deco glass below the enormous mirror, at least six feet in diameter. Everywhere lamps, small, fringed or mushroom-topped on long, slender stems: everywhere figures, ferns, flowers. In foreground, a set of black/silver/turquoise vases and modelled head on decorated brass tray and glass-sided table: replica of a twenties’ cigarette girl, now bearing a tray of jewellery. 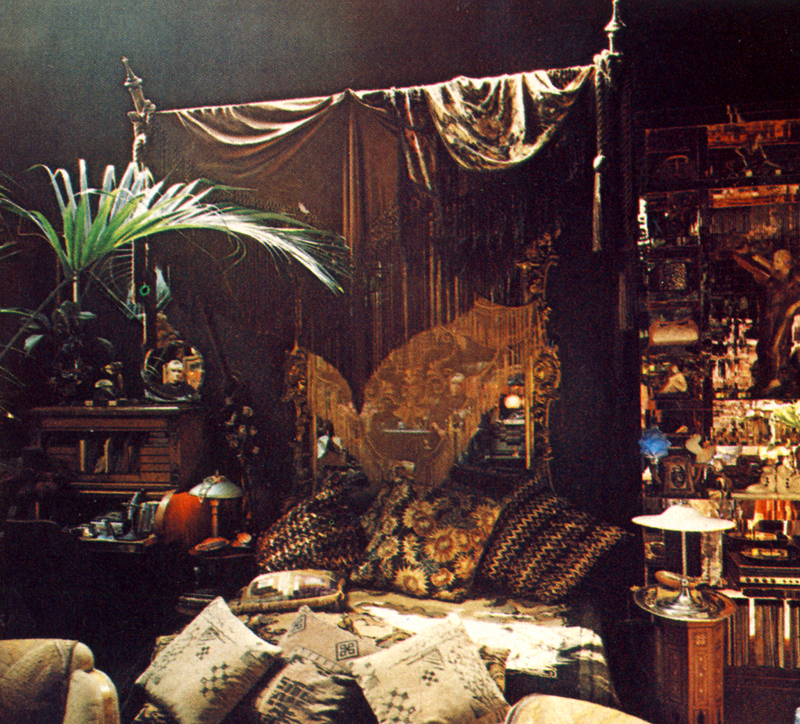 The bed, above, hung with shawls, scattered with sequinned brocaded cushions. Barbara Hulanicki reflected in the bedside mirror on the writing desk and in the centre of the mirrored bed-head. 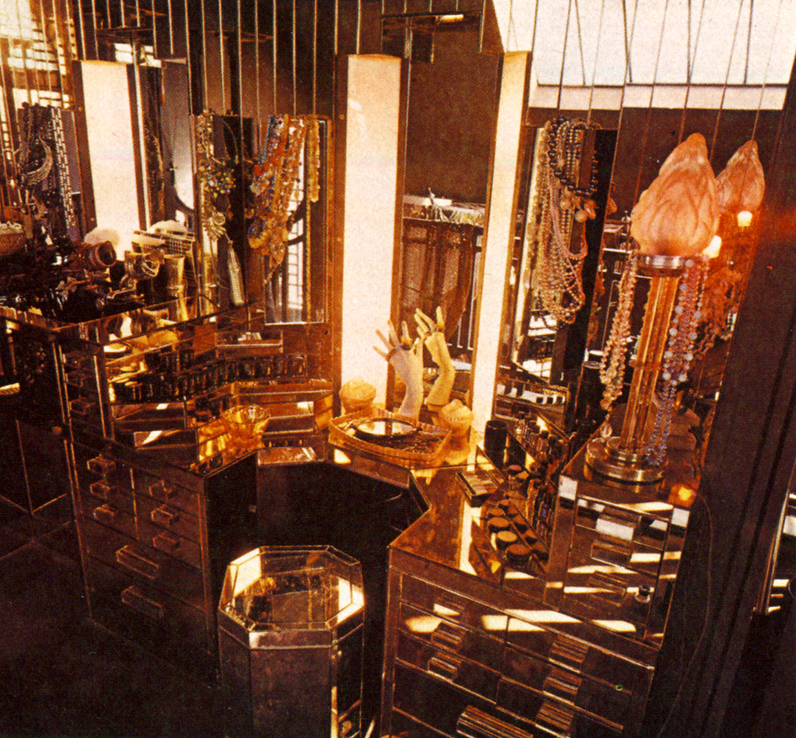 On the right, a peach mirror flex set of shelves, with photographs, figures, eight Art Deco plastic handbags.